The subject of "machine vs. free weight" superiority has been the source of much debate over the years.Both modes of resistance are merely training tools that in terms of personal choice cannot ever replace or overshadow one's efforts in the gym.The target muscle(s) under stress do not know, nor can they differentiate between a bag of sand, a rock, machine or dumbbell as the source of resistance. Push a car around the block 2 times and tell me if your quads and hips received an intense stimulus application!! Effort applied, not the equipment, is the key .There are slight differences in terms of biomechanical leverage factors and stability from machine to free weight, yet one need not overcomplicate the process. 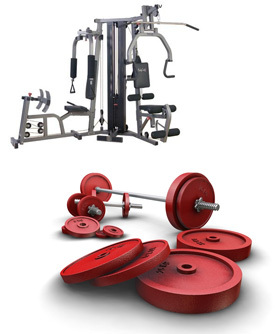 Machines may be safer, but are less versatile, and cost more (if equipping a home gym), while free weights allow one to vary the ROM (range of motion) somewhat, more favorably recruit stabilizer muscles, and are less expensive. The bottom line ---to offset monotony and get the best of both worlds, use both ! !